Shortly after he was inaugurated, President Donald Trump tweeted that the press was the “enemy of the people” because, he claimed, they made up news. Though Trump had made fiery accusations of the media on the campaign trail— accusing them of reporting “fake news”—he ratcheted up his criticism when he uttered the enemy-of-the-people phrase by mimicking some of the worst tyrants of the 20th century—including Stalin and Hitler. Since that first tweet, Trump has used the phrase multiple times. Recently, Trump blamed the media for the bombs that were sent to CNN and high-profile Democrats. And, again, he used one of his favorite pot-shots: The press is the enemy of the people. 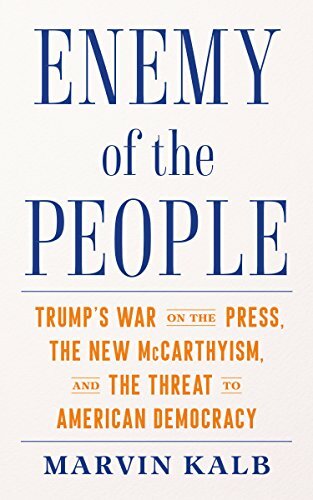 In his book Enemy of the People, long-time broadcast journalist Marvin Kalb, details the origins and use of the enemy-of-the-people phrase through the ages, beginning with Emperor Nero, who was labeled the first enemy of the public for letting Rome burn while he vacationed in Greece. Later critics of the French Revolution were dubbed “enemies of the people” and led to the guillotine. During the Russian Revolution, the phrase was revived to label capitalists and landowners who were exiled to Siberia. Stalin adopted the phrase for anyone who disagreed with him, including communists. Kalb throws himself into this history lesson, reporting that President Richard Nixon put Kalb on his “enemies list.” Kalb, who is in his 80s, describes his early years in Moscow first as a Russian translator for the American Embassy and later as chief correspondent for CBS and NBC. Published by the liberal thinktank, the Brookings Institute, where Kalb is a senior fellow, Kalb knows his audience is unlikely to be anyone who agrees with Trump. Kalb pointedly makes a case of Trump as a liar whose rhetoric is not to be trusted. Kalb reiterates statistics, such as those from the Washington Post which found Trump had made 3,001 false or misleading claims during his first 466 days in office. Kalb argues that because Trump was an avid listener to Breitbart radio, he most likely heard Caddell’s interview and was likely inspired by the phrase. It’s also likely, he writes, that the phrase was picked up by Breitbart Executive Chairman Stephen Bannon who was friends with Trump and who went to work for Trump on the campaign trail and later in the White House. Kalb’s argument is compelling. Kalb’s quick history lesson of the phrase and his detective work pinpointing how the phrase probably came into Trump’s lexicon is where this book is the strongest. But when Kalb pulls the authorial lens away from Trump, the book lags. Kalb’s favorite topic—and one that takes up 80 pages in a 157-page book (sans index)—is McCarthyism. Kalb writes at length about the McCarthy communist hearings and of Edward R. Murrow’s challenge to McCarthy. The narration feels stale. We’ve heard this tale before and Kalb has little new to add except for his fawning depiction of Murrow as defender of the First Amendment. Though Murrow might deserve the praise, pitting the legendary journalist and McCarthy as if they were pugilists makes them more caricatures, than characters. When Kalb finally returns to Trump, at the end of the book, he quickly chronicles other institutions that Trump has disparaged, including the FBI and the Justice Department. He makes a case that a democracy that is going to hold Trump in check needs a free press. It’s a point that after spending so much time on the dangers of McCarthyism, feels preachy. Instead of addressing how the press can counter Trump’s attacks—a perspective that Kalb certainly has authority to deliver after covering multiple world leaders for decades—Kalb flings his final assault, calling Trump the true enemy of the people. It’s an easy barb and one that feels beneath the book’s intellectual discourse. Cheryl L. Reed's debut novel is Poison Girls. She is also the author of Unveiled: The Hidden Lives of Nuns, a journalist and an assistant professor at Syracuse University's Newhouse School of Communications. She was previously the editor of the Chicago Sun-Times book review section.